Snickers just released a very mysterious black and white teaser for the Snickers Super Bowl 50 ad. The Snickers commercial will feature a "Happy Birthday" serenade from America's original blonde bombshell, Marilyn Monroe. Well, almost. The teaser for the Snickers Super Bowl 50 commercial shows a hungry Marilyn Monroe who is not motivated and has a very deep voice. The guessing is on who the actor is that plays the cranky Hollywood diva. My guess is that the Marilyn in the teaser is Willem Dafoe. What do you think? In the Snickers Super Bowl 50 ad the hungry Marilyn Monroe will likely change into somebody beautiful matching Marilyn Monroe. Kate Upton is a possibility. We will have to wait until the Big Game to see the full Snickers commercial. Watch the teaser for the Snickers Super Bowl 50 ad below. 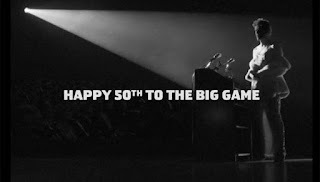 "Since we're kicking-off the '50' celebration of one of the world's most iconic events it seemed only fitting to cast Marilyn Monroe, a Hollywood icon with global appeal, to help us celebrate," said Allison Miazga-Bedrick, Director, Snickers Brand. "But this is just a small glimpse of what America should expect from Snickers on Super Bowl Sunday. As always the ad will feature a funny surprise that we're confident will satisfy fans hungry for a laugh." The all-new 30-second Snickers commercial will air during the first quarter of Super Bowl 50 on Feb. 7 and continues the "You're Not You When You're Hungry" campaign.